Growing up, my family had traditions centered around the holidays. I remember delivering frozen turkeys at Thanksgiving with my local Rotary club. 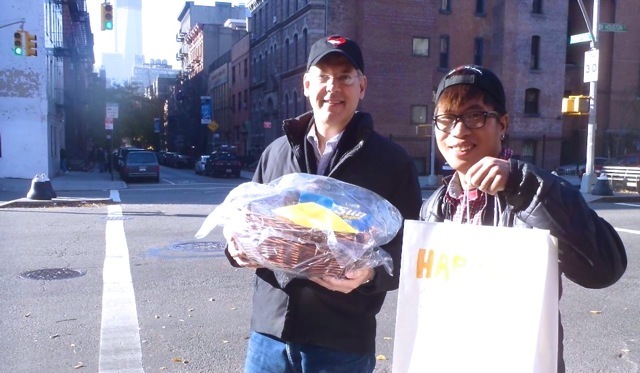 Last Thanksgiving my family was given the opportunity to do something quintessentially New York: we delivered delicious Thanksgiving meals to New Yorkers living with severe illnesses. I have always tried to instill a sense of social responsibility to my son Mathew, now a teen. This began when, at the age of four, I would take him with me to spend the night supervising homeless shelters in Manhattan. 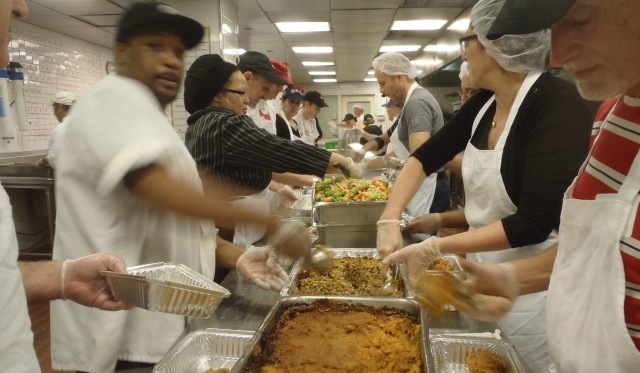 With no permanent holiday tradition, my partner John, Matt and I volunteered last Thanksgiving, and then again Christmas Day, to spread love, hope - and great, nutritious food, cooked by the kitchen staff and volunteers of God's Love We Deliver (God's Love). 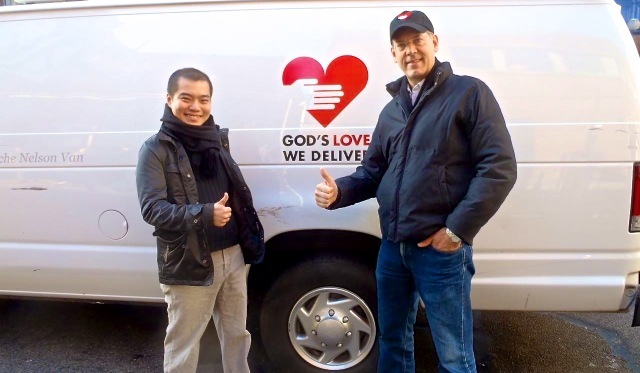 Volunteers cooking and delivering meals to New Yorkers living with severe illnesses is the crux of God's Love's mission. Photo: God's Love We Deliver. I remember back in the 1980's when the G.M.H.C., God's Love, and other social agencies began to support those newly afflicted with a mysterious disease known as AIDS. I volunteered in the AIDS ward of Bellevue and I heard of a hospice volunteer named Ganga Stone paid a visit to an AIDS patient too ill to cook for himself. Ganga's compassion took hold, a meal was prepared and taken over: God's Love We Deliver was born with support of people of all faiths. I carefully explained to my kid that this was the mission of the God's Love. As often a parent is, I was wrong. In the decades since it was founded, this agency has expanded to serve people living with any illness, not just HIV/AIDS. My son was amused I had not kept up. My son Mathew and I volunteering last Thanksgiving. Being sick and hungry is a crisis, and an urgent one at that. Gods Love understands and strives to deliver food - individually-tailored meals that meet the medical needs of each client - within a delivery day of being contacted. Efficient and inspirational. The Nutrition Services Department at God's Love We Deliver seeks to improve the health and well being of their clients by providing high-quality meals and nutritional education. From the development of therapeutic menus, to nutrition counseling and the safe delivery of client meals, God's Love sees the power of food as medicine and understands the significance of proper nutrition. Our registered dietitians work with our Executive Chef to create a health supportive menu to meet the nutritional needs of people living with serious illnesses. Clients and their caregivers discuss specific requirements with a God's Love dietitian, who individualizes the menu as appropriate. Modifications are made based on medical diagnoses and support symptom management. Texture modified meals - minced or pureed foods - are also available for people who are experiencing swallowing or chewing difficulties. 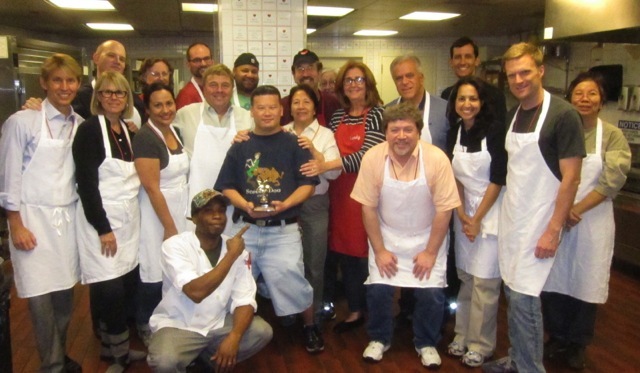 Every week, clients and their dependent children each receive ten well-balanced meals prepared in our professional kitchen with the help of many volunteers. In addition to our nutritious meals, continuous nutrition counseling and education are provided. In short, nutrition is the signature difference at God's Love We Deliver. What began as an urgent response to the AIDS epidemic has grown to be an urgent response to all those who are too ill to cook for themselves. 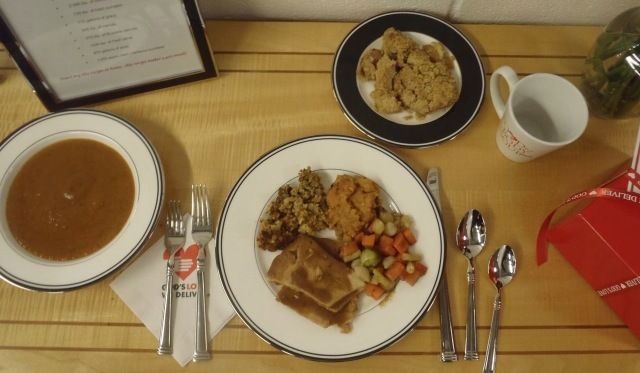 Nutritious and delicious, each meal is customized to the individual client's needs. Thanksgiving 2012. Photo: John Lee/Stewardship Report. Being on a limited budget makes it very hard for me to eat as healthy as I love to - and struggling with an illness makes it even harder. With the help of God's Love, I have more food in my home and eat better. My health has improved a great deal and I am so thankful for them. I love how they greet and take care of us. God's Love is always there when I need them. While the God's Love team of registered dietitians works with clients to develop unique nutrition plans to help manage their illnesses, medication side effects and promote wellness, they also provide culturally-appropriate education materials for the clients that reinforce their counseling sessions. In addition, they also conduct nutrition presentations and cooking demonstrations at organizations throughout the community, bringing their expertise to a wider base and improving general nutrition knowledge to groups as a whole. Check out their client menus and FAQs. The kitchen is ground zero for the efforts of God's Love to improve the life of its clients. Without the help of the amazing volunteers of God's Love - nearly 8,000 strong every year - God's Love would not be able to prepare and deliver more than 1.1 million delicious and nutritious meals annually to neighbors in need. Volunteers outnumber staff by a ratio of more than 100 to 1 and they work in the kitchen, deliver meals, work in the office and help out with special events. Each day there are volunteer opportunities in all different areas of God's Love, for individuals, corporate and student groups. The volunteer staff helps supervise, manage and welcome our volunteers to our God's Love community, morning to night. These dedicated volunteers come from all walks of life and from diverse socioeconomic, religious and ethnic backgrounds. God's Love prides itself on the strong sense of community amongst volunteers and staff alike. Read more about individual volunteers by reading their Volunteer Spotlight. Stay up to date with the Volunteer Department and the terrific volunteers by reading their volunteer newsletter, Special Delivery. Find out more about holidays and special events volunteer opportunities. Review the volunteer FAQ's and then sign up to help here. Many, many New Yorkers volunteer and support God's Love We Deliver. Working moms and dads, librarians, investment bankers - in short, a snapshot of our population. Famous faces at God's Love are many, including Joan Rivers, Heidi Klum, and Michael Kors. Humanitarian Michael Kors has supported God's Love for more than twenty years. Photo: God's Love We Deliver. 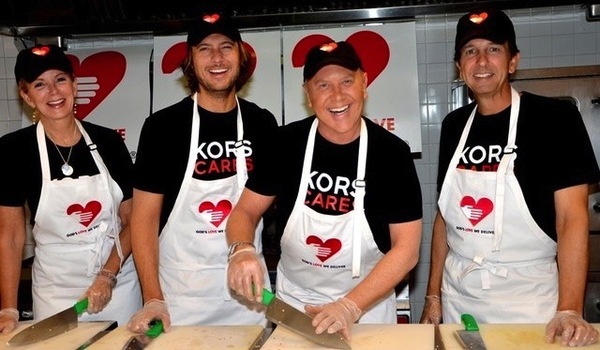 Last fall, Michael Kors was given the Golden Heart Award for a lifetime of Achievement for his more than two decades, and on Oct. 15, 2012 the nonprofit bestowed him with the 2012 Golden Heart Award for Lifetime Achievement. In his acceptance speech he said, "God's Love does a phenomenal job of feeding those who are too sick to shop or cook for themselves. I can't think of a worthier organization to collaborate with." Having run and worked with organizations for several decades, I am acutely aware of the challenges. Never have I seen an organization run a largely volunteer operation with more efficiency and integrity. Corporate America has responded in appreciation. Companies that support the organization are too numerous to mention, but a few that I admire include Michael Kors, Bloomingdale's & Macy's, Polo Ralph Lauren, Whole Foods Market NYC, Bloomberg, Wells Fargo, American Express, MAC Cosmetics, Avon, Lenox, The Gap, Levi Strauss & Co., Calvin Klein - and even Architectural Digest. We are so grateful for the dedicated and wonderful support we get from our volunteers. What's so amazing though, is that every time we say, "Thank you for your service," they tell us that "they get more than they give." This is truly inspirational to everyone of us at God's Love. 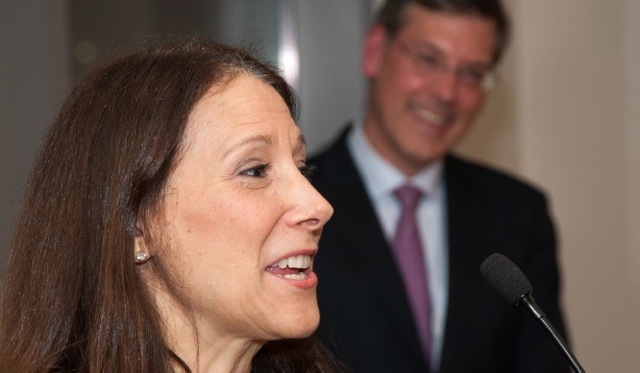 Karen Pearl, the executive director of God's Love, spoke at our foundation's reception last fall. Volunteering at God's Love We Deliver was a life changing experience. It was a joy seeing new faces while I delivering food with my dad and his partner on Thanksgiving. I wish to do this every holiday season in the future. My partner John Lee, son Mathew, and I volunteering with God's Love as our holiday tradition. God's Love We Deliver, to me, is the best managed service organization in New York City and ranks as my number one volunteer opportunity. I am honored to know Karen Pearl, to work with the volunteers with my family on the holidays, and to meet the clients, average New Yorkers who are living with serious illnesses, for whom God's Love is delivered by people like you and me.